The ever-quotable Warren Buffett says, “Never invest in a business you can’t understand.” Well, as we round out another terrific year, I want to challenge you a bit by noting that many of us regularly invest in people we may not understand. So, why make relatively blind “people investments” when you (hopefully) would not make such a financial investment? Granted, I am a bit of a shameless evangelist for the power of validated behavioral insights, but I genuinely believe they are applicable – and I would venture imperative – across virtually any scenario, organization or industry. Harvard research tells us that 87% of business and life performance challenges are caused by behavioral differences. So, applying our proven online behavioral management solutions, may not take the number of those challenges to zero, but we can get you damn close. One reason we can do that – in addition to our powerful products and processes – is that we have an impressive cadre of partners and colleagues who help us vet and deploy the solutions. In turn, our phenomenal clients invest in the process with us, providing valuable feedback that helps us – and them – play at a higher level. Winning is good, but a win-win is better. Because of those unparalleled alliances, we’re poised to not only play better in 2019, but to play bigger. Our team has discovered and embraced the book “Play Bigger”, which cleverly and clearly identifies the approach needed for positioning a company for high growth: It’s all about identifying the problem you are solving and setting your business up to be a category king (think Uber). It is more about creativity in market positioning than directly disrupting an industry, though disruption can be the impact or part of it. Whatever work you are doing; this book is a “must read”. In fact, I am so enthusiastic about the book that I’ll commit to sending the first 18 people who respond to this (2019 will be DNA Behavior’s 18th year) the book – on me. Digital or hard-copy, your choice. 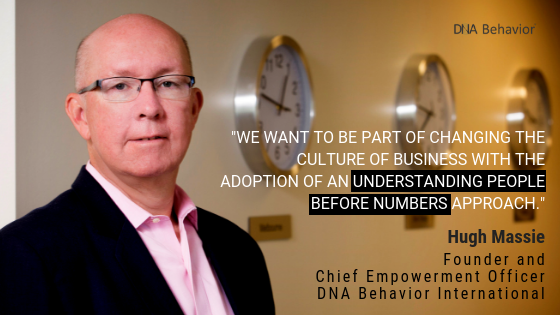 At DNA Behavior we are solving the problem of how an organization delivers meaningful customized experiences to its employees and clients on a mass scale. To do that you must know their unique style, and knowing their marketing “persona” based on demographics is not enough. Two people can have the same persona, but not the same personality. So, unless personality insights – beginning with communication insights – are integrated, you do not get there. As we play bigger, we’ll be demonstrating, in the words of the book, what category we are king of: Online behavioral management. In 2019 we are launching our end-to-end real-time behavioral management tooling – a highly automated discovery profile debrief that is situationally dynamic. We already have this in Financial DNA with the “Market Mood” tool that integrates real-time stock market movements to behavioral style. But in 2019 we will take this further and also launch a platform for Business DNA. We can only do this now because technological developments allow us to, and the market place is demanding customization. Thanks to you, 2018 has been a landmark year for landing major deals that implement our API strategy, through which we become the “behavioral chip” inside the tech platforms of other businesses. This helps us realize our brand promise of delivering meaningful experiences to employees and clients customized to their unique style. In particular, we have had success with large financial services firms and banks launching platforms in the employee financial wellness space. They all have very different angles and approaches – but the key point is that the online management of financial personality is here to stay and becoming a category king in its own right. This reinforces our strategy. We completed one of the world’s largest known behavioral finance studies looking at the financial behavior data of more than 35,000 people and how it connects to validated personality insights. The research demonstrates a high degree of alignment between the spending habits, planned giving, investing style and other behaviors to the personality style measured by DNA Behavior. We knew our system produces highly predictive results with a 91% overall reliability, this research confirms how people live it out. Finally, our “why” in business is to foster people to become more self-empowered. The work noted above is a big step to achieving this “why” goal on a mass scale. We want to be part of changing the culture of business with the adoption of an Understanding People before Numbers approach. We know that, businesses of any category must do far more work in the area of culture if they are to grow on a sustainable basis. Behavioral management is just one of many components needed to build a strong culture. Looping back to the wisdom of Warren, Buffett says, “Only when you combine sound intellect with emotional discipline do you get rational behavior.” I would posit that you also need that winning combination in order to optimize your organizational culture. So, in 2019 we will be championing the growth of culture and want all of you involved. What Is The Misunderstanding Of An Investor’s Risk Profile? In my journey as a wealth mentor over the last 20 years, and developing a rigorous scientifically based behavioral finance approach for the last 15, I have watched the risk profiling discussion seriously evolve from denigration to one that is being more intelligently embraced and applied. From advisors, clients, compliance departments, and regulators: what is the misunderstanding of an investor’s risk profile? Lack of clarity in the terminology as to what defines risk profile. For instance, interchanging risk tolerance, risk perception, and risk capacity although all have different meanings. Regulators worldwide have created principles based laws around risk profiling. But the legislative vagueness leaves too much open for interpretation leaving many firms doing virtually nothing. Compliance departments allowing “tick-the-box” methods of risk profiling along a broad array of approaches from doing nothing, to guessing, observing, or 3-to-5 hacked together questions. Applying the risk profile in a linear way based on a single measurement. Lack of understanding risk profiling at a deeper level because many of the instruments and processes are slapdash and poorly constructed. Even the better tools are one dimensional but are used to measure all aspects of risk, which is wrong and misleading. The Inability of advisors/consultants to integrate risk profiling and behavioral discovery into the client onboarding process. An unwillingness to have the client invest time in additional questionnaires viewed as distracting from getting on-boarded. The plethora of online investing platforms leveraging a quick & dirty approach to “knowing the investor” without any real insights. 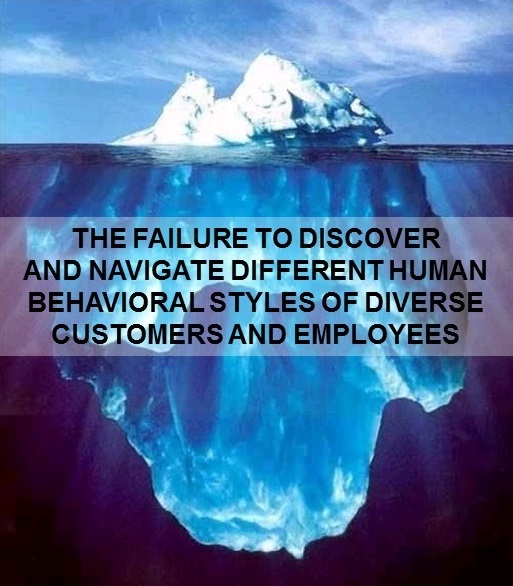 The positive development now is that there is a heightened awareness of the need to adopt a more formalized behavioral discovery process, recognizing that risk taking, tolerance, and loss aversion are separate and measurable personality traits. And it’s a combination of all the risk factors, along with many cognitive biases, that interplay in how decisions are made. Further, the compliance environment is requiring a strengthening in processes because the #1 issue on the agenda of regulators is dealing with the increase in investor complaints from a lack of suitability. Suitable solutions will never be able to be satisfactorily offered with demonstrated client buy-in unless EACH of the multi-dimensional elements that make up the risk profile is understood by both the advisor and the client. 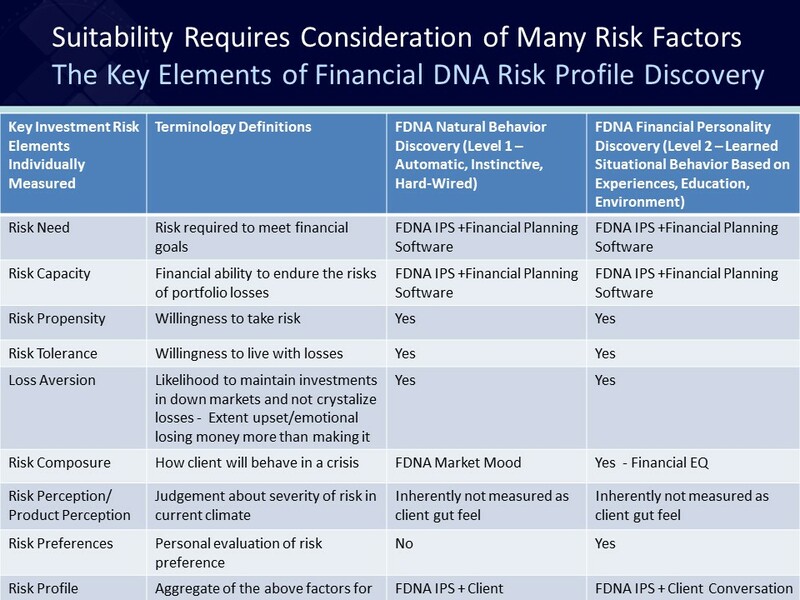 For the last 15 years in my role as a wealth mentor, I have been guiding advisors and clients to understand the multi-dimensional nature of their risk profile as highlighted in the table below. Use the client’s long-term risk profile for building a long-term portfolio and predicting how they will intrinsically make decisions over the long term (this is what Daniel Kahneman refers to as the Level 1 behavior). The correct questionnaire structure is absolutely critical to getting this result. In my terms, this is the hard-wired natural DNA Behavior. The questionnaire should be designed and independently validated based on sound psychometric principles. Understand the short-term risk profile based on current situational attitudes and how the client manages themselves (Kahneman’s Level 2 behavior). This is what many risk tolerance questionnaires seek to measure with varying degrees of quality and accuracy. Separate the various calculations of the Risk Need to achieve the client’s goals and Risk Capacity being their financial ability to sustain losses from the various personality traits associated with risk, risk propensity (desire to take risks), risk tolerance (emotional ability to live with losses), loss aversion (emotional reaction to markets), risk and product perception (reaction to situations and products ), and risk preferences (personal evaluation of preparedness to take risk in a given situation or with a product). Know each client’s Risk Composure – how they are feeling during up and down market movements. Some will embrace down markets and others will fear them. Of course, added to this is knowing how to communicate with clients during these different times. When wealth mentoring the client, help them set purpose based goals that are clearly defined for keeping them focused on what’s important. An IPS can be used as the guide-stick and for getting the client’s emotional buy-in. Finally, as an advisor, know the influence of your own risk profile and behavioral biases. Your mindset can inadvertently play out with the client whereby over time they eat your risk profile. Part 1 of 3 – How well he knows himself! Well, the Trumpster beat the odds and has jumped over everyone to win the Presidency. How did he do it? The answer is deeply rooted in Donald Trump’s behavioral insights – his natural, hard-wired Influencer DNA Behavioral Style. 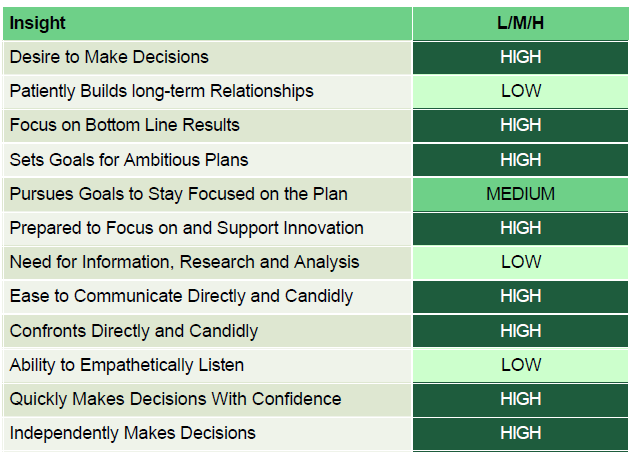 These personality insights identify the primary drivers of his good (and bad) leadership decisions, financial dealings and general approach to life. I’m not running for office. I don’t have to be politically correct. I don’t have to be a nice person. Like I watch some of these weak-kneed politicians, it’s disgusting. I don’t have to be that way. Into trying new ways. Sometimes they win, and other times they fail. Donald Trump’s behavioral insights reflect that he is supremely cognizant of these behavioral abilities and uses each to further his personal agenda. It is clear Trump knows his personality; he knows success is his lifetime goal. Anyone who has even limited behavioral awareness should have known that the election trail was all about the salesman’ getting the sale (the White House). But from here on we’ll see the negotiator because that’s how he knows he will get results. Trump will be a hard-nosed negotiator; whether putting together a White House team or negotiating trade deals on the world stage, he will be reluctant to give in on even the smallest points. The old idiom my way or the highway will probably be the new White House mantra. Trump won’t be fearful of taking risks, he will play the odds, some you win and some you lose, but as long as he is always moving forward to the goals and objectives he has set – he’ll feel he is on track. As a decision maker, Donald Trump will not be readily swayed by sentiment or humanitarian impulses. This will be advantageous when it comes to balancing competing interests or bargaining with adversaries. He is likely to be a bold and ruthlessly aggressive decision maker showing little concern for the emotions of others. That said – he knows how to keep people on board; he knows how to set others up for success in order to achieve his goals. The result is, a Trump that is equipped to be a strategic player in situations where achieving results is a priority and concentrate on matter-of-fact, practical issues. Listening to those around him talking about his loyalty, great to work for, cares about me and my family, further demonstrates his ability to manage his personality. Confident, goal-setting people, such as Trump, excel by blending their strong drive to reach key goals with sound knowledge, high-quality processes and quality control standards. 98/66 Trump makes fast decisions; sometimes getting it wrong but always moving forward. Clinton hesitates, wanting more information, with a propensity to procrastinate. 73/96 Trump breaks down boundaries and doesn’t wait to anticipate outcomes. Clinton is only interested in knowing the outcome of decisions she might make. 99/54 Trump is all about setting the bar as high as possible in achieving goals. Clinton tends towards keeping things as they are. 62/95 Trump changes direction mid-stream if a better plan is formulated to bring success. Clinton sticks to agreed and established direction and agendas to achieve goals even if they may not work out. 92/66 Trump is open to new ideas if it achieves his goals. Clinton is more stuck in the status quo. 90/66 Trump is not into details, he just wants results and will say what he wants to say even if possibly wrong; decides instinctively. Clinton needs details, analysis, and research in order to make decisions. 90/79 Trump is clear and forthright in expressing and communicating. Clinton is less so, which might cause confusion in mixed messaging. 96/79 Trump is not fazed by conflict. Clinton is less comfortable with conflict. 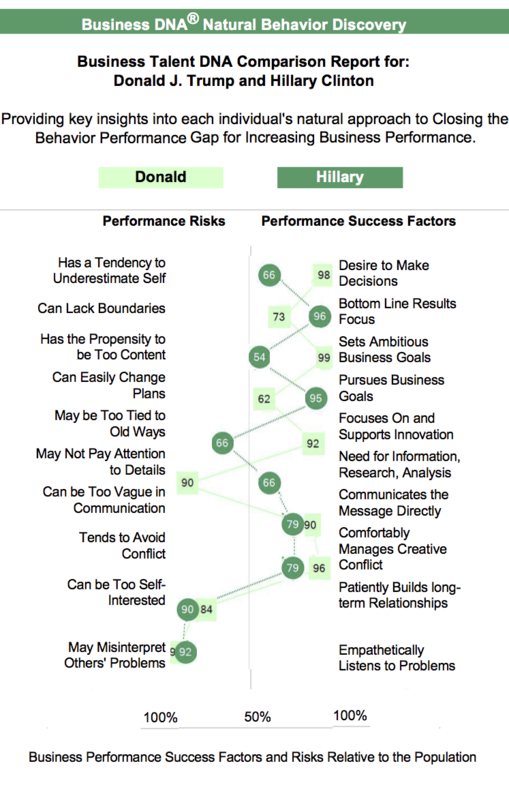 84/90 Trump is motivated by his own personal interest or advantage, especially without regard for others. Clinton, even more so. 90/92 Neither are empathetic towards issues others face. There is mounting evidence to show that financial advisors indeed have to radically change their approach to the way they relate to investors. 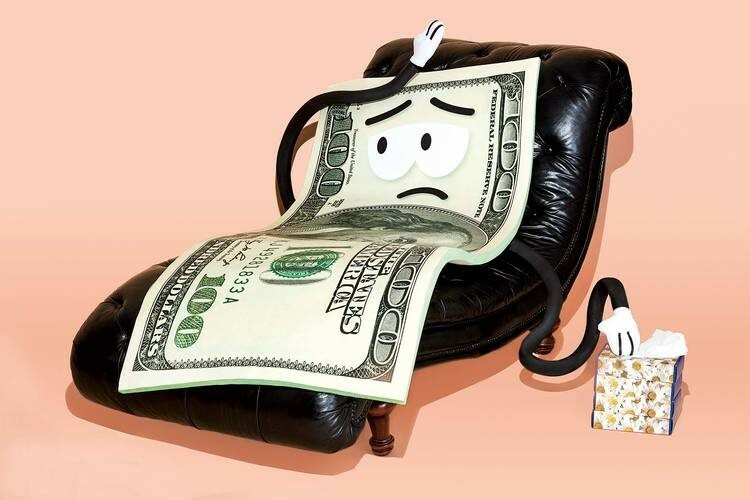 Money has always been a ‘touchy’ ‘emotional’ subject. Whether discussions resolve around – making it, losing it, sharing it, incorrectly quoting about it i.e. “money is the root of all evil” when the correct quote is, “For the love of money is a root of all kinds of evil.” Timothy 6:10 – the topic can become toxic. Why then are we surprised (as I was) to find financial therapists popping up in our world? Or why do we think that financial advisors need to know all about our life and emotional state like a doctor? Is it unlike the mechanic that inquires about our driving habits as part of diagnosing a problem, or advising if those squeaky brakes need to be changed sooner than later? In that case, we’ve surrounded ourselves with all sorts of professionals and experts, acting as doctors and therapists to help us along in meeting our daily needs and lifelong goals. Well, it’s actually quite simple really: the majority of us have no idea what triggers we inherently have that govern the way we manage our finances. We would be alarmed to know we have inherent behavioral biases. We would cringe at the thought of having allowed the bankruptcy our grandparents suffered to dictate the ugliness with which we now accumulate and “store” our wealth. But take heart these triggers can be revealed, they can be managed and we can work with our financial advisors to develop plans to create wealth that line up with our life goals and values. The truth is financial advisors need to know how to uncover what lies below the surface of our decision making. They need to know what historical events impact our view of creating/managing wealth. So yes, they do have to approach the advisor/investor relationship a bit differently today. But here’s the good news, they don’t have to spend 8 years or so studying to become a doctor. The right tools and training for uncovering our core natural behavior is the key. For example, DNA Behavior International has a significant discovery platform called Financial DNA that reliably discovers all dimensions of an investor’s financial personality and inherent bias for making life and financial decisions. The discovery process is fast and accurate and places vital information in the hands of financial advisors before the first meeting with their investor clients. Investors need an advisor who can guide them towards making informed decisions, one who speaks to them in a style that’s easily relatable while mitigating emotional, kneejerk responses. Emotion plays a significant role in so many parts of our lives that having an investor to coach us through the feelings and reactions, and keep decision making on the right track is necessary. Financial advisors must understand their clients at a deeper level. 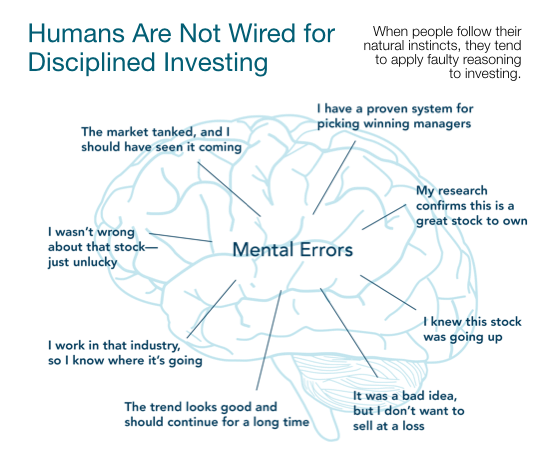 It is essential to have a practical understanding of the psychology, emotions and biases that significantly influence investor’s imperfect decision-making patterns. Furthermore, advisors should understand how to recognize and manage their own biases when working with investors. Ultimately, it is fair to say that the role of the financial advisor has changed, and will continue to do so. But there is no doubt that with a reputable and appropriate process, advisors can be well informed in advance of a first investor meeting. Conversations around money will always be complex. While we talk more freely about other intimate subjects, when money enters the conversation, emotion, distorted stories, ego, and even fear enter right along with it. In conclusion, if we understand our financial behavior then we can balance our emotions and beliefs. We will act more wisely with our money. Conversely, if we lack understanding and are confused about why we make certain decisions, then the decisions will be poor, creating financial chaos and discontent. Advisors need to be fully equipped and prepared to unravel investor’s complex issues around money. Investors need to be able to trust advisors in order to reveal information. How Do I Get People to Listen to Me? How many times have you been in a situation where you were trying to communicate with someone and it felt you might as well have been talking to the wall? I remember explaining a concept to a client using a PowerPoint and the client didn’t hear a word I said because he was focused on how he didn’t like the color scheme on the slide. 60% of communications fail because communication styles and preferences are not aligned. Based upon 1999 Stanford Research study. Our brains are hard-wired to process information and learn a certain way. Most people accept this by now due to the volume of research on the topic. However, we can learn how to adapt to different communication styles to increase our effectiveness. 1. Start with the End Goal in Mind – What is the purpose of the interaction and how does it connect to your audience’s goal (what’s in it for them?) Use bullets and executive summaries to convey more information with fewer words. Details can be provided after the summary if needed, but Goal-setters don’t read long emails/blogs or sit through long presentations. 2. Provide Options – If you only give them one recommendation or option, you will most likely get pushback or a “no.” They want to be able to make a choice. They will likely want to discuss it. 3. Explain Who is Involved -Being more relationship-focused, their brains first have to understand who is involved, their role, how they fit into the discussion and what they may think about it. They also respond well to social events and informal communication methods. 4. Use Visuals – Rather than send a long email or written instructions use a picture, infographic or demo to better help their brains process the information and retain it. They need to experience it to learn. 5. How You Say It Matters – The right tone is especially important for this group. They prefer supportive and low-risk interactions and solutions. Email may not be the best choice, but if you do send an email, be very careful to consider them as a person and how they might perceive it or “feel” about it. 6. Slow Down and Reassure – They like to be thorough and appreciate step-by-step instructions. They want to be very comfortable and sure of their actions before they act. 7. Stick to the facts – They prefer to primarily focus on tasks/results and do not necessarily want a lot of social interactions. They tend to be logical, want to “get to the truth,” and understand “why,” therefore, they are more comfortable when they have more details, information, and research. 8. Don’t Try Appealing to their Emotional Side – I repeat, stick to the facts, policies and procedures, and the logical explanation. If you try to sway them with name-dropping, leverage office politics, oversell a concept with marketing hype or appeal to their emotional side, you will actually repel them, not influence them. What’s your communication style? For more information on the research, how it works, or how to apply this knowledge, contact inquiries@dnabehavior.com. No one said it would be easy.? Our inboxes and phones are overloaded with emails, texts and voicemails. Our to do lists have grown exponentially. So how do you create a compelling message to capture advisors attention in less than 30 seconds? But heres your challenge.? You can know their business but if you dont communicate your message in the advisors style, your message is lost. Translation: NO SALE. Paul Roth is a top advisor and you have the perfect annuity for him to add to his clients portfolio.? His communication style is Lifestyle which means he likes the big picture, enjoys being around people, talkative and always upbeat. Your marketing department just emailed him The Top 10 Best Annuities (of course, your annuity is #1). Paul opens the email and all he sees are your logo and lots of words.? He immediately deletes it. Why? He prefers bullet points and pictures.? All of your cleverly crafted words and details of your #1 ranked annuity did not even register with him! Your internal sales desk is part of this campaign so shortly after the email is delivered, they begin making the calls to get advisors educated and excited about this product.? Paul is in Rons territory, so he jumps on the phone to Paul.? He takes the call because he knows Ron and your firm.? Rons communication style is Information so she starts the conversation by giving Paul all the pertinent facts and is proud of it because he knows the advisors business! What he doesnt know is that Paul stopped listening within a minute.? Why?? Because Paul wants someone to set the big picture context first and then talk about how other advisors are using it. ?Details of the product offering are secondary to Paul so hewilleither ask the questions later or look it up online.? But Paul is polite, thanks Ron for calling and ends the call. Ron feels positive about the call and he continues on with the rest of his calls with the same script. Now lets move to the other integral part of this campaign: the external wholesaler.? Luckily, Jennifers communication style is Lifestyle so she presents the annuity to Paul in exactly the way that appeals to Paul. He now understands the annuity, how it differs from the competitors and how to position it in the clients portfolio. SALE IS MADE! But what if Jennifer wasnt the same communication style?? The three-pronged marketing campaign to promote your #1 ranked annuity would fail on more than half of the advisors. Not because you dont have a good product but simply because you havent customized your message. Still thinking the soft side of big data doesnt produce revenue? Maybe now is the time to take a look at a behavioral marketing system that can make a big difference in the effectiveness of your marketing campaigns.